Free Spirit Nail Art: Ghosts!!!! Hello everyone! 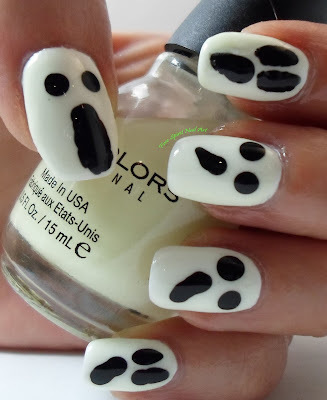 Today I have some spooky ghosts to share with you! Okay...so they are more silly than spooky but I love them! 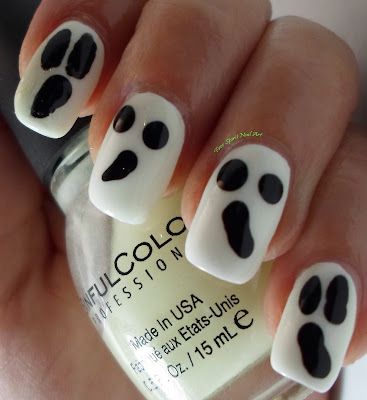 This is a super simple design to do, especially using a dotting tool! 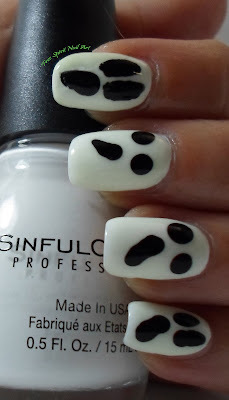 The colors used are Sinful Colors Snow Me White and Sinful Colors Black on Black. I also used Sinful Colors Glow in the dark on top of the white before I applied the black eyes and mouths but I completely forgot to get a glow in the dark pic! I'm sure I will do another glow in the dark mani before October is over so I will just have to share it then but there is a pretty decent bit of glow from Sinful Colors Glow in the Dark! I'm getting more and more excited for Halloween, how about you? Thanks for looking and check back soon for my next Halloween Mani! A friend of mine knows how to nail art and she is kind of perfect in it. She keep on trying beautiful art on her nails to make them look cute. I will share this post with her.